This card is for 5 Challenges so I started out with several premises in my mind. I'm not usually a big fan of Toile fabric or paper, but this pattern from The Paper Studio really caught my eye. I guess it's the soft sages, sepias, and cherries that are pleasing to my eye. I used some of the new Log Cabin Smooch Spritz on the fern leaves for just a very subtle little bit of sparkle. 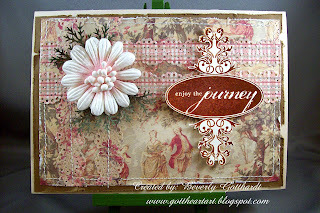 I used 2 Martha Stewart punches: fern, and lacy border. I stamped the sentiment with sepia and clear embossed it for a nice pop. All in all, I think this is one of the prettiest vintage cards I have made so far and I can almost hear a little anniversary conversation as the couple takes an evening stroll through this lovely grove. Supplies: Card Blank 5 1/4" X 7 1/4" The Paper Company, Papers: The Paper Studio-Mirabella, Stampin Up-Very Vanilla, Stamp: Pink Paislee-365 Degrees, Ink: Ranger Archival Ink-Sepia, Stampin Up clear embossing powder, Martha Stewart punches: fern, lacy border punch, Stampin Up-Log Cabin Smooch Spritz, flower unknown, Tim Holtz distress tool, sewing machine, pop dots. Stunning! I love the paper and the stitching! The border punches were the perfect ouch. Thanks for joining us at Always Playing with Paper! This is beautiful Beverly! I love the mix of patterns and that flower. Thank you for joining us this week! Very nice and so pretty too, thanks for joining us at Digi Doodle Shops Best. Your project is just awe-inspiring! Thank you for getting Punched and or Cut up with us at Digi Doodle Shop's Best! Stunning card! Thank you so much for entering this in our challenge at Digi Doodle Shop's Best. Your card is so beautiful. Thanks for joining us in the CCEE challenge. This is a gorgeous card, very classy! Thanks for playing along at Crafty Cardmakers. Super creation! Thanks so much for joining us this week at The Digi Doodle Shop's Best! P.S. If you love challenges you are sure to love my new blog, hope you will stop by and check it out!